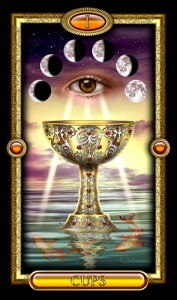 The Ace of Cups is a card of joy and abundance overflowing the heart. It could mean the onset of a new love affair – or, if you are already committed, the renewal of your relationship. 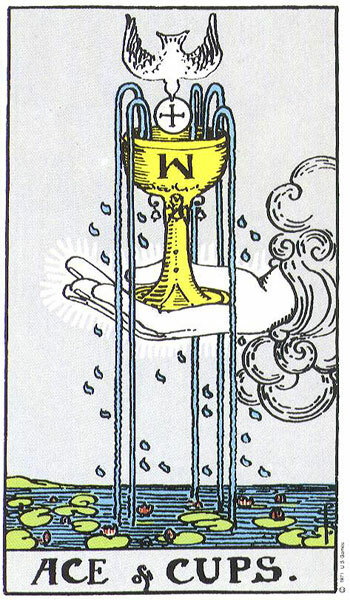 Everything is fresh and new (as with all access) and the card recalls the Holy Grail – symbolizing the great quest of your heart or your life. By going with the flow and following your heart, you reach the greatest level of success, and both your work and your creative pursuits are fulfilling. 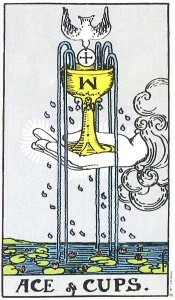 In a reading: This ace rules all things new and wonderful: romance, fortune, opportunity, beginnings. Expect to find yourself surrounded with joy or in the midst of a spiritual awakening.